Fentanyl transdermal system exposes patients and other users to the risks of opioid addiction, abuse, and misuse, which can lead to overdose and death. Assess each patientâ€™s risk prior to prescribing fentanyl transdermal system, and monitor all patients regularly for the development of these behaviors and conditions [see Warnings and Precautions (5.1)]. Serious, life-threatening, or fatal respiratory depression may occur with use of fentanyl transdermal system. Monitor for respiratory depression, especially during initiation of fentanyl transdermal system or following a dose increase. Because of the risk of respiratory depression, fentanyl transdermal system is contraindicated for use as an as-needed analgesic, in non-opioid tolerant patients, in acute pain, and in postoperative pain [see Contraindications (4) and Warnings and Precautions (5.2)]. Accidental exposure to even one dose of fentanyl transdermal system, especially in children, can result in a fatal overdose of fentanyl. Deaths due to an overdose of fentanyl have occurred when children and adults were accidentally exposed to fentanyl transdermal system. Strict adherence to the recommended handling and disposal instructions is of the utmost importance to prevent accidental exposure [see Warnings and Precautions (5.3)]. Prolonged use of fentanyl transdermal system during pregnancy can result in neonatal opioid withdrawal syndrome, which may be life-threatening if not recognized and treated, and requires management according to protocols developed by neonatology experts. If opioid use is required for a prolonged period in a pregnant woman, advise the patient of the risk of neonatal opioid withdrawal syndrome and ensure that appropriate treatment will be available [see Warnings and Precautions (5.4)]. The concomitant use of fentanyl transdermal system with all cytochrome P450 3A4 inhibitors may result in an increase in fentanyl plasma concentrations, which could increase or prolong adverse drug effects and may cause potentially fatal respiratory depression. In addition, discontinuation of a concomitantly used cytochrome P450 3A4 inducer may result in an increase in fentanyl plasma concentration. Monitor patients receiving fentanyl transdermal system and any CYP3A4 inhibitor or inducer [see Warnings and Precautions (5.5) and Clinical Pharmacology (12.3)]. Exposure of the fentanyl transdermal system application site and surrounding area to direct external heat sources, such as heating pads or electric blankets, heat or tanning lamps, sunbathing, hot baths, saunas, hot tubs, and heated waterbeds may increase fentanyl absorption and has resulted in fatal overdose of fentanyl. Warn patients to avoid exposing the application site and surrounding area to direct external heat sources [see Warnings and Precautions (5.6)]. Risks from Concomitant Use with Benzodiazepines or Other CNS Depressants Concomitant use of opioids with benzodiazepines or other central nervous system (CNS) depressants, including alcohol, may result in profound sedation, respiratory depression, coma, and death [see Warnings and Precautions (5.7), Drug Interactions (7)]. Reserve concomitant prescribing of fentanyl transdermal system and benzodiazepines or other CNS depressants for use in patients for whom alternative treatment options are inadequate. Limit treatment to the minimum effective dosages and durations. These highlights do not include all the information needed to use FENTANYL TRANSDERMAL SYSTEM safely and effectively. 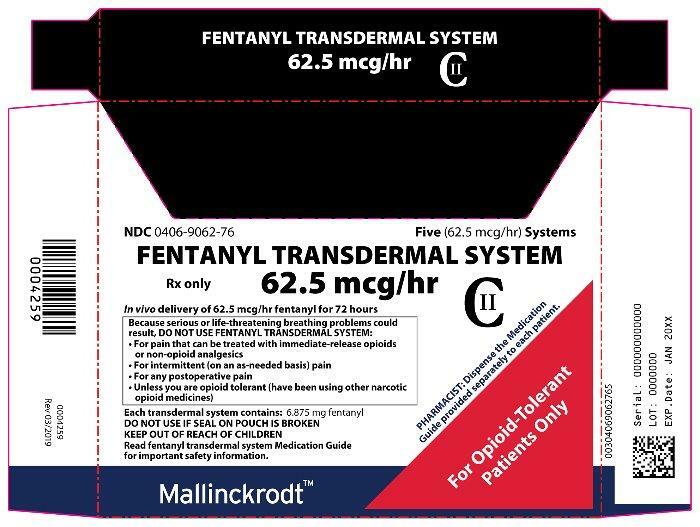 See full prescribing information for FENTANYL TRANSDERMAL SYSTEM. Fentanyl transdermal system is not indicated as an as-needed (prn) analgesic. To report SUSPECTED ADVERSE REACTIONS, contact Mallinckrodt at 1-800-778-7898 or FDA at 1-800-FDA-1088 or www.fda.gov/medwatch. Fentanyl transdermal system is indicated for the management of pain in opioid-tolerant patients, severe enough to require daily, around-the-clock, long-term opioid treatment and for which alternative treatment options are inadequate. Patients considered opioid-tolerant are those who are taking, for one week or longer, at least 60 mg morphine per day, 25 mcg transdermal fentanyl per hour, 30 mg oral oxycodone per day, 8 mg oral hydromorphone per day, 25 mg oral oxymorphone per day, 60 mg oral hydrocodone per day, or an equianalgesic dose of another opioid. Because of the risks of addiction, abuse, and misuse with opioids, even at recommended doses, and because of the greater risks of overdose and death with extended-release/long-acting opioid formulations [see Warnings and Precautions (5.1)], reserve fentanyl transdermal system for use in patients for whom alternative treatment options (e.g., non-opioid analgesics or immediate-release opioids) are ineffective, not tolerated, or would be otherwise inadequate to provide sufficient management of pain. Due to the risk of respiratory depression, fentanyl transdermal system is only indicated for use in patients who are already opioid-tolerant. Discontinue or taper all other extended-release opioids when beginning fentanyl transdermal system therapy. As fentanyl transdermal system is only for use in opioid-tolerant patients, do not begin any patient on fentanyl transdermal system as the first opioid [see Indications and Usage (1)]. Use the lowest effective dosage for the shortest duration consistent with individual patient treatment goals [see Warnings and Precautions (5)]. Initiate the dosing regimen for each patient individually, taking into account the patientâ€™s severity of pain, patient response, prior analgesic treatment experience, and risk factors for addiction, abuse, and misuse [see Warnings and Precautions (5.1)]. Monitor patients closely for respiratory depression, especially within the first 24 to 72 hours of initiating therapy with fentanyl transdermal system when serum concentrations from the initial patch will peak [see Warnings and Precautions (5.2)]. Do not initiate treatment with fentanyl transdermal system in opioid nontolerant patients [see Contraindications (4)]. 24-hour fentanyl requirements which could result in adverse reactions. In a fentanyl transdermal system clinical trial, patients were converted from their prior opioid to fentanyl transdermal system using Table 1 as a guide for the initial fentanyl transdermal system dose. Each fentanyl transdermal system is worn continuously for up to 72 hours [see Dosage and Administration (2.6)]. These are not tables of equianalgesic doses. The conversion doses in these tables are only for the conversion from one of the listed oral or parenteral opioid analgesics to fentanyl transdermal system. The tables cannot be used to convert from fentanyl transdermal system to another opioid because these conversions will result in an overestimation of the dose of the new opioid (these conversions are conservative) and may result in fatal overdosage. • Table 1 should not be used to convert from fentanyl transdermal system to other therapies because this conversion to fentanyl transdermal system is conservative. Use of Table 1 for conversion to other analgesic therapies can overestimate the dose of the new agent. Overdosage of the new analgesic agent is possible [see Dosage and Administration (2.8)]. 3. Refer to Table 2 for the range of 24-hour oral morphine doses that are recommended for conversion to each fentanyl transdermal system dose. Use this table to find the calculated 24-hour morphine dose and the corresponding recommended initial fentanyl transdermal system dose. 4. Initiate fentanyl transdermal system treatment using the recommended dose and titrate patients upwards (no more frequently than 3 days after the initial dose and every 6 days thereafter) until analgesic efficacy is attained. For patients that require more than 100 mcg/hour, several transdermal systems may be used. 5. Do not use Table 2 to convert from fentanyl transdermal system to other therapies because this conversion to fentanyl transdermal system is conservative and will overestimate the dose of the new agent. • NOTE: In clinical trials, these ranges of daily oral morphine doses were used as a basis for conversion to fentanyl transdermal system. Individually titrate fentanyl transdermal system to a dose that provides adequate analgesia and minimizes adverse reactions. Continually reevaluate patients receiving fentanyl transdermal system to assess the maintenance of pain control and the relative incidence of adverse reactions, as well as monitoring for the development of addiction, abuse, or misuse [see Warnings and Precautions (5.1)]. Frequent communication is important among the prescriber, other members of the healthcare team, the patient, and the caregiver/family during periods of changing analgesic requirements, including initial titration. During chronic therapy, periodically reassess the continued need for opioid analgesics. Patients who experience breakthrough pain may require a dosage adjustment of fentanyl transdermal system, or may need rescue medication with an appropriate dose of an immediate-release analgesic. If the level of pain increases after dosage stabilization, attempt to identify the source of increased pain before increasing the fentanyl transdermal system dosage. If unacceptable opioid-related adverse reactions are observed, consider reducing the dosage. Adjust the dose to obtain an appropriate balance between management of pain and opioid-related adverse reactions. Avoid the use of fentanyl transdermal system in patients with severe hepatic impairment. In patients with mild to moderate hepatic impairment, start with one-half of the usual dosage of fentanyl transdermal system. Closely monitor for signs of respiratory and central nervous system depression, including at each dosage increase [see Warnings and Precautions (5.15), Use in Specific Populations (8.6) and Clinical Pharmacology (12.3)]. Avoid the use of fentanyl transdermal system in patients with severe renal impairment. In patients with mild to moderate renal impairment, start with one-half of the usual dosage of fentanyl transdermal system. Closely monitor for signs of respiratory and central nervous system depression, including at each dosage increase [see Warnings and Precautions (5.16), Use in Specific Populations (8.7) and Clinical Pharmacology (12.3)]. FENTANYL TRANSDERMAL SYSTEMS ARE FOR TRANSDERMAL USE ONLY. Patients should apply fentanyl transdermal system to intact, non-irritated, and non-irradiated skin on a flat surface such as the chest, back, flank, or upper arm. In young children and persons with cognitive impairment, adhesion should be monitored and the upper back is the preferred location to minimize the potential of inappropriate patch removal. Hair at the application site may be clipped (not shaved) prior to system application. If the site of fentanyl transdermal system application must be cleansed prior to application of the patch, do so with clear water. Do not use soaps, oils, lotions, alcohol, or any other agents that might irritate the skin or alter its characteristics. Allow the skin to dry completely prior to patch application. Patients should apply fentanyl transdermal system immediately upon removal from the sealed package. The patch must not be altered (e.g., cut) in any way prior to application. Fentanyl transdermal system should not be used if the pouch seal is broken or if the patch is cut or damaged. The transdermal system is pressed firmly in place with the palm of the hand for 30 seconds, making sure the contact is complete, especially around the edges. Each fentanyl transdermal system may be worn continuously for 72 hours. The next patch is applied to a different skin site after removal of the previous transdermal system. If problems with adhesion of the fentanyl transdermal system occur, the edges of the patch may be taped with first aid tape. If problems with adhesion persist, the patch may be overlayed with a transparent adhesive film dressing. If the patch falls off before 72 hours, dispose of it by folding in half and flushing down the toilet. A new patch may be applied to a different skin site. Patients (or caregivers who apply fentanyl transdermal system) should wash their hands immediately with soap and water after applying fentanyl transdermal system. Contact with unwashed or unclothed application sites can result in secondary exposure to fentanyl transdermal system and should be avoided. Examples of accidental exposure include transfer of a fentanyl transdermal system from an adultâ€™s body to a child while hugging, sharing the same bed as the patient, accidental sitting on a patch and possible accidental exposure of a caregiverâ€™s skin to the medication in the patch while applying or removing the patch. Instruct patients, family members, and caregivers to keep patches in a secure location out of the reach of children and of others for whom fentanyl transdermal system was not prescribed. Instruct patients to avoid exposing the fentanyl transdermal system application site and surrounding area to direct external heat sources, such as heating pads or electric blankets, heat or tanning lamps, sunbathing, hot baths, saunas, hot tubs, and heated waterbeds, while wearing the system [see Warnings and Precautions (5.6)]. Failure to properly dispose of fentanyl transdermal system has resulted in accidental exposures and deaths, including deaths of children [see Warnings and Precautions (5.3)]. Instruct patients to dispose of used patches immediately upon removal by folding the adhesive side of the patch to itself, then flushing down the toilet. Instruct patients to remove unused patches from their pouches, remove the protective liners, fold the patches so that the adhesive side of the patch adheres to itself, and to immediately flush the patches down the toilet. Instruct patients to dispose of any patches remaining from a prescription as soon as they are no longer needed. To convert patients to another opioid, remove fentanyl transdermal system and titrate the dose of the new analgesic based upon the patientâ€™s report of pain until adequate analgesia has been attained. Upon system removal, 17 hours or more are required for a 50% decrease in serum fentanyl concentrations. Withdrawal symptoms are possible in some patients after conversion or dose adjustment [see Warnings and Precautions (5.19)]. When discontinuing fentanyl transdermal system and not converting to another opioid, use a gradual downward titration, such as a 50% dosage reduction every 6 days, while monitoring carefully for signs and symptoms of withdrawal. If the patient develops these signs or symptoms, raise the dose to the previous level and taper more slowly, either by increasing the interval between decreases, decreasing the amount of change in dose, or both. Do not abruptly discontinue fentanyl transdermal system [see Warnings and Precautions (5.19), Drug Abuse and Dependence (9.3)]. It is not known at what dose level fentanyl transdermal system may be discontinued without producing the signs and symptoms of opioid withdrawal. Fentanyl Transdermal System 12 mcg/hour* (system size 3.9 cm2) is dark blue in color. Fentanyl Transdermal System 25 mcg/hour (system size 7.8 cm2) is red in color. Fentanyl Transdermal System 50 mcg/hour (system size 15.6 cm2) is green in color. Fentanyl Transdermal System 75 mcg/hour (system size 23.4 cm2) is blue in color. Fentanyl Transdermal System 100 mcg/hour (system size 31.2 cm2) is gray in color. 12.5 mcg/hour) to distinguish it from a possible 125 mcg/hr dosage that could be prescribed by multiple transdermal systems. patients who are not opioid-tolerant. the management of acute or intermittent pain, or in patients who require opioid analgesia for a short period of time. the management of post-operative pain, including use after out-patient or day surgeries, (e.g., tonsillectomies). the management of mild pain. patients with significant respiratory depression [see Warnings and Precautions (5.9)]. in patients with acute or severe bronchial asthma in an unmonitored setting or in the absence of resuscitative equipment [see Warnings and Precautions (5.9)]. in patients with known or suspected gastrointestinal obstruction, including paralytic ileus [see Warnings and Precautions (5.17)]. in patients with hypersensitivity to fentanyl (e.g., anaphylaxis) or any components of the transdermal system [see Adverse Reactions (6.2)]. Fentanyl transdermal system contains fentanyl, an opioid agonist and a Schedule II controlled substance. As an opioid, fentanyl transdermal system exposes users to the risks of addiction, abuse, and misuse. Because modified-release products such as fentanyl transdermal system deliver the opioid over an extended period of time, there is a greater risk for overdose and death due to the larger amount of fentanyl present [see Drug Abuse and Dependence (9)]. Although the risk of addiction in any individual is unknown, it can occur in patients appropriately prescribed fentanyl transdermal system. Addiction can occur at recommended doses and if the drug is misused or abused. Assess each patientâ€™s risk for opioid addiction, abuse, or misuse prior to prescribing fentanyl transdermal system, and monitor all patients receiving fentanyl transdermal system for the development of these behaviors and conditions. Risks are increased in patients with a personal or family history of substance abuse (including drug or alcohol abuse or addiction) or mental illness (e.g., major depression). The potential for these risks should not, however, prevent the proper management of pain in any given patient. Patients at increased risk may be prescribed opioids such as fentanyl transdermal system, but use in such patients necessitates intensive counseling about the risks and proper use of fentanyl transdermal system along with intensive monitoring for signs of addiction, abuse, and misuse. Abuse or misuse of fentanyl transdermal system by placing it in the mouth, chewing it, swallowing it, or using it in ways other than indicated may cause choking, overdose, and death [see Overdosage (10)]. Opioids are sought by drug abusers and people with addiction disorders and are subject to criminal diversion. Consider these risks when prescribing or dispensing fentanyl transdermal system. Strategies to reduce these risks include prescribing the drug in the smallest appropriate quantity and advising the patient on the proper disposal of unused drug [see Patient Counseling Information (17)]. Contact local state professional licensing board or state controlled substances authority for information on how to prevent and detect abuse or diversion of this product. Serious, life-threatening, or fatal respiratory depression has been reported with the use of opioids, even when used as recommended. Respiratory depression, if not immediately recognized and treated, may lead to respiratory arrest and death. Management of respiratory depression may include close observation, supportive measures, and use of opioid antagonists, depending on the patientâ€™s clinical status [see Overdosage (10)].Carbon dioxide (CO2) retention from opioid-induced respiratory depression can exacerbate the sedating effects of opioids. Fentanyl transdermal system is indicated only in opioid tolerant patients because of the risk for respiratory depression and death. While serious, life-threatening, or fatal respiratory depression can occur at any time during the use of fentanyl transdermal system, the risk is greatest during the initiation of therapy or following a dosage increase. Monitor patients closely for respiratory depression within the first 24 to 72 hours of initiating therapy with and following dosage increases of fentanyl transdermal system. To reduce the risk of respiratory depression, proper dosing and titration of fentanyl transdermal system are essential [see Dosage and Administration (2)]. Overestimating the fentanyl transdermal system dosage when converting patients from another opioid product can result in fatal overdose with the first dose. Accidental exposure to fentanyl transdermal system, especially in children, can result in respiratory depression and death due to an overdose of fentanyl. A considerable amount of active fentanyl remains in fentanyl transdermal system even after use as directed. Death and other serious medical problems have occurred when children and adults were accidentally exposed to fentanyl transdermal system. Accidental or deliberate application or ingestion by a child or adolescent will cause respiratory depression, and has resulted in deaths. Placing fentanyl transdermal system in the mouth, chewing it, swallowing it, or using it in ways other than indicated may cause choking or overdose that could result in death. Improper disposal of fentanyl transdermal system in the trash has resulted in accidental exposures and deaths. Advise patients about strict adherence to the recommended handling and disposal instructions in order to prevent accidental exposure to fentanyl transdermal system [see Dosage and Administration (2.6), (2.7)]. Exposure to fentanyl transdermal systems discarded in the trash by children have been reported and have resulted in deaths. Prolonged use of fentanyl transdermal system during pregnancy can result in withdrawal in the neonate. Neonatal opioid withdrawal syndrome, unlike opioid withdrawal syndrome in adults, may be life-threatening if not recognized and treated, and requires management according to protocols developed by neonatology experts. Observe newborns for signs of neonatal opioid withdrawal syndrome and manage accordingly. Advise pregnant women of the risk of neonatal opioid withdrawal syndrome and ensure that appropriate treatment will be available [see Use in Specific Populations (8.1), Patient Counseling Information (17)]. Concomitant use of fentanyl transdermal system with a CYP3A4 inhibitor, such as macrolide antibiotics (e.g., erythromycin), azole-antifungal agents (e.g., ketoconazole), and protease inhibitors (e.g., ritonavir), may increase plasma concentrations of fentanyl and prolong opioid adverse reactions, which may cause potentially fatal respiratory depression [see Warnings and Precautions (5.2)], particularly when an inhibitor is added after a stable dose of fentanyl transdermal system is achieved. Similarly, discontinuation of a CYP3A4 inducer, such as rifampin, carbamazepine, and phenytoin, in fentanyl transdermal system-treated patients may increase fentanyl plasma concentrations and prolong opioid adverse reactions. When using fentanyl transdermal system with CYP3A4 inhibitors or discontinuing CYP3A4 inducers in fentanyl transdermal system-treated patients, monitor patients closely at frequent intervals and consider dosage reduction of fentanyl transdermal system until stable drug effects are achieved [see Dosage and Administration (2.3), Drug Interactions (7)]. Concomitant use of fentanyl transdermal system with CYP3A4 inducers or discontinuation of a CYP3A4 inhibitor could decrease fentanyl transdermal system plasma concentrations, decrease opioid efficacy or, possibly, lead to a withdrawal syndrome in a patient who had developed physical dependence to fentanyl. When using fentanyl transdermal system with CYP3A4 inducers or discontinuing CYP3A4 inhibitors, monitor patients closely at frequent intervals and consider increasing the opioid dosage if needed to maintain adequate analgesia or if symptoms of opioid withdrawal occur [see Drug Interactions (7)]. Exposure to heat may increase fentanyl absorption and there have been reports of overdose and death as a result of exposure to heat. A clinical pharmacology study conducted in healthy adult subjects has shown that the application of heat over the fentanyl transdermal system increased fentanyl exposure [see Clinical Pharmacology (12.3)]. Warn patients to avoid exposing the fentanyl transdermal system application site and surrounding area to direct external heat sources [see Dosage and Administration (2.6)]. Profound sedation, respiratory depression, coma, and death may result from the concomitant use of fentanyl transdermal system with benzodiazepines and/or other CNS depressants (e.g., non-benzodiazepine sedatives/hypnotics, anxiolytics, tranquilizers, muscle relaxants, general anesthetics, antipsychotics, other opioids, alcohol). Because of these risks, reserve concomitant prescribing of these drugs for use in patients for whom alternative treatment options are inadequate. Observational studies have demonstrated that concomitant use of opioid analgesics and benzodiazepines increases the risk of drug-related mortality compared to use of opioid analgesics alone. Because of similar pharmacological properties, it is reasonable to expect similar risk with the concomitant use of other CNS depressant drugs with opioid analgesics [see Drug Interactions (7)]. Advise both patients and caregivers about the risks of respiratory depression and sedation when fentanyl transdermal system is used with benzodiazepines or other CNS depressants (including alcohol and illicit drugs). Advise patients not to drive or operate heavy machinery until the effects of concomitant use of the benzodiazepine or other CNS depressant have been determined. Screen patients for risk of substance use disorders, including opioid abuse and misuse, and warn them of the risk for overdose and death associated with the use of additional CNS depressants including alcohol and illicit drugs [see Drug Interactions (7), Patient Counseling Information (17)]. Based on a pharmacokinetic model, serum fentanyl concentrations could theoretically increase by approximately one-third for patients with a body temperature of 40°C (104°F) due to temperature-dependent increases in fentanyl released from the system and increased skin permeability. Monitor patients wearing fentanyl transdermal systems who develop fever closely for sedation and respiratory depression and reduce the fentanyl transdermal system dose, if necessary. Warn patients to avoid strenuous exertion that leads to increased core body temperature while wearing fentanyl transdermal system to avoid the risk of potential overdose and death. The use of fentanyl transdermal system in patients with acute or severe bronchial asthma in an unmonitored setting or in the absence of resuscitative equipment is contraindicated. Patients with Chronic Pulmonary Disease: Fentanyl transdermal system-treated patients with significant chronic obstructive pulmonary disease or cor pulmonale, and those with a substantially decreased respiratory reserve, hypoxia, hypercapnia, or pre-existing respiratory depression are at increased risk of decreased respiratory drive including apnea, even at recommended dosages of fentanyl transdermal system [see Warnings and Precautions (5.2)]. Elderly, Cachectic, or Debilitated Patients: Life-threatening respiratory depression is more likely to occur in elderly, cachectic, or debilitated patients because they may have altered pharmacokinetics or altered clearance compared to younger, healthier patients [see Warnings and Precautions (5.2)]. Monitor such patients closely, particularly when initiating and titrating fentanyl transdermal system and when fentanyl transdermal system is given concomitantly with other drugs that depress respiration [see Warnings and Precautions (5.2)]. Alternatively, consider the use of non-opioid analgesics in these patients. Cases of serotonin syndrome, a potentially life-threatening condition, have been reported during concomitant use of fentanyl transdermal system with serotonergic drugs. Serotonergic drugs include selective serotonin reuptake inhibitors (SSRIs), serotonin and norepinephrine reuptake inhibitors (SNRIs), tricyclic antidepressants (TCAs), triptans, 5-HT3 receptor antagonists, drugs that affect the serotonergic neurotransmitter system (e.g., mirtazapine, trazodone, tramadol), and drugs that impair metabolism of serotonin (including MAO inhibitors, both those intended to treat psychiatric disorders and also others, such as linezolid and intravenous methylene blue) [see Drug Interactions (7)]. This may occur within the recommended dosage range. Serotonin syndrome symptoms may include mental status changes (e.g., agitation, hallucinations, coma), autonomic instability (e.g., tachycardia, labile blood pressure, hyperthermia), neuromuscular aberrations (e.g., hyperreflexia, incoordination, rigidity), and/or gastrointestinal symptoms (e.g., nausea, vomiting, diarrhea). The onset of symptoms generally occurs within several hours to a few days of concomitant use, but may occur later than that. Discontinue fentanyl transdermal system immediately if serotonin syndrome is suspected. Fentanyl transdermal system may cause severe hypotension including orthostatic hypotension and syncope in ambulatory patients. There is an increased risk in patients whose ability to maintain blood pressure has already been compromised by a reduced blood volume or concurrent administration of certain CNS depressant drugs (e.g., phenothiazines or general anesthetics) [see Drug Interactions (7)]. Monitor these patients for signs of hypotension after initiating or titrating the dosage of fentanyl transdermal system. In patients with circulatory shock, fentanyl transdermal system may cause vasodilation that can further reduce cardiac output and blood pressure. Avoid the use of fentanyl transdermal system in patients with circulatory shock. In patients who may be susceptible to the intracranial effects of CO2 retention (e.g., those with evidence of increased intracranial pressure or brain tumors), fentanyl transdermal system may reduce respiratory drive, and the resultant CO2 retention can further increase intracranial pressure. Monitor such patients for signs of sedation and respiratory depression, particularly when initiating therapy with fentanyl transdermal system. Opioids may also obscure the clinical course in a patient with a head injury. Avoid the use of fentanyl transdermal system in patients with impaired consciousness or coma. Fentanyl transdermal system may produce bradycardia. Monitor patients with bradyarrhythmias closely for changes in heart rate, particularly when initiating therapy with fentanyl transdermal system. A clinical pharmacology study with fentanyl transdermal system in patients with cirrhosis has shown that systemic fentanyl exposure increased in these patients. Because of the long half-life of fentanyl when administered as fentanyl transdermal system and hepatic metabolism of fentanyl, avoid use of fentanyl transdermal system in patients with severe hepatic impairment. Insufficient information exists to make precise dosing recommendations regarding the use of fentanyl transdermal system in patients with impaired hepatic function. Therefore, to avoid starting patients with mild to moderate hepatic impairment on too high of a dose, start with one half of the usual dosage of fentanyl transdermal system. Closely monitor for signs of sedation and respiratory depression, including at each dosage increase [see Dosage and Administration (2.4), Use in Specific Populations (8.6) and Clinical Pharmacology (12.3)]. A clinical pharmacology study with intravenous fentanyl in patients undergoing kidney transplantation has shown that patients with high blood urea nitrogen level had low fentanyl clearance. Because of the long half-life of fentanyl when administered as fentanyl transdermal system, avoid the use of fentanyl transdermal system in patients with severe renal impairment. Insufficient information exists to make precise dosing recommendations regarding the use of fentanyl transdermal system in patients with impaired renal function. Therefore, to avoid starting patients with mild to moderate renal impairment on too high of a dose, start with one-half of the usual dosage of fentanyl transdermal system. Closely monitor for signs of sedation and respiratory depression, including at each dosage increase [see Dosage and Administration (2.5), Use in Specific Populations (8.7) and Clinical Pharmacology (12.3)]. Fentanyl transdermal system is contraindicated in patients with known or suspected gastrointestinal obstruction, including paralytic ileus. The fentanyl in fentanyl transdermal system may cause spasm of the sphincter of Oddi. Opioids may cause increases in serum amylase. Monitor patients with biliary tract disease, including acute pancreatitis for worsening symptoms. The fentanyl in fentanyl transdermal system may increase the frequency of seizures in patients with seizure disorders, and may increase the risk of seizures occurring in other clinical settings associated with seizures. Monitor patients with a history of seizure disorders for worsened seizure control during fentanyl transdermal system therapy. Avoid the use of mixed agonist/antagonist (e.g., pentazocine, nalbuphine, and butorphanol) or partial agonist (e.g., buprenorphine) analgesics in patients who are receiving a full opioid agonist analgesic, including fentanyl transdermal system. In these patients, mixed agonist/antagonist and partial agonist analgesics may reduce the analgesic effect and/or may precipitate withdrawal symptoms [see Drug Interactions (7)]. Fentanyl transdermal system may impair the mental or physical abilities required for the performance of potentially dangerous activities, such as driving a car or operating machinery. Warn patients not to drive or operate dangerous machinery unless they are tolerant to the effects of the fentanyl transdermal system and know how they will react to the medication [see Patient Counseling Information (17)]. The safety of fentanyl transdermal system was evaluated in 216 patients who took at least one dose of fentanyl transdermal system in a multicenter, double-blind, randomized, placebo-controlled clinical trial of fentanyl transdermal system. This trial examined patients over 40 years of age with severe pain induced by osteoarthritis of the hip or knee and who were in need of and waiting for joint replacement. The most common adverse reactions (â‰¥5%) in a double-blind, randomized, placebo-controlled clinical trial in patients with severe pain were nausea, vomiting, somnolence, dizziness, insomnia, constipation, hyperhidrosis, fatigue, feeling cold, and anorexia. Other common adverse reactions (â‰¥5%) reported in clinical trials in patients with chronic malignant or nonmalignant pain were headache and diarrhea. Adverse reactions reported for â‰¥1% of fentanyl transdermal system-treated patients and with an incidence greater than placebo-treated patients are shown in Table 3. The most common adverse reactions that were associated with discontinuation in patients with pain (causing discontinuation in â‰¥1% of patients) were depression, dizziness, somnolence, headache, nausea, vomiting, constipation, hyperhidrosis, and fatigue. Adverse reactions not reported in Table 3 that were reported by â‰¥1% of fentanyl transdermal system-treated adult and pediatric patients (N=1854) in 11 controlled and uncontrolled clinical trials of fentanyl transdermal system used for the treatment of chronic malignant or nonmalignant pain are shown in Table 4. The safety of fentanyl transdermal system was evaluated in three open-label trials in 289 pediatric patients with chronic pain, 2 years of age through 18 years of age. Adverse reactions reported by â‰¥1% of fentanyl transdermal system-treated pediatric patients are shown in Table 5. The following adverse reactions have been identified during post-approval use of fentanyl transdermal system. Because these reactions are reported voluntarily from a population of uncertain size, it is not always possible to reliably estimate their frequency or establish a causal relationship to drug exposure. Serotonin syndrome: Cases of serotonin syndrome, a potentially life-threatening condition, have been reported during concomitant use of opioids with serotonergic drugs. Adrenal insufficiency: Cases of adrenal insufficiency have been reported with opioid use, more often following greater than one month of use. Anaphylaxis: Anaphylaxis, including anaphylactic shock, has been reported with ingredients contained in fentanyl transdermal system. Androgen deficiency: Cases of androgen deficiency have occurred with chronic use of opioids [see Clinical Pharmacology (12.2)]. Table 6 includes clinically significant drug interactions with fentanyl transdermal system. The concomitant use of fentanyl transdermal system and CYP3A4 inhibitors can increase the plasma concentration of fentanyl, resulting in increased or prolonged opioid effects particularly when an inhibitor is added after a stable dose of fentanyl transdermal system is achieved [see Warnings and Precautions (5.5)]. After stopping a CYP3A4 inhibitor, as the effects of the inhibitor decline, the fentanyl transdermal system plasma concentration will decrease [see Clinical Pharmacology (12.3)], resulting in decreased opioid efficacy or a withdrawal syndrome in patients who had developed physical dependence to fentanyl. If concomitant use is necessary, consider dosage reduction of fentanyl transdermal system until stable drug effects are achieved. Monitor patients for respiratory depression and sedation at frequent intervals. If a CYP3A4 inhibitor is discontinued, consider increasing the fentanyl transdermal system dosage until stable drug effects are achieved. Monitor for signs of opioid withdrawal. The concomitant use of fentanyl transdermal system and CYP3A4 inducers can decrease the plasma concentration of fentanyl [see Clinical Pharmacology (12.3)], resulting in decreased efficacy or onset of a withdrawal syndrome in patients who have developed physical dependence to fentanyl [see Warnings and Precautions (5.5)]. After stopping a CYP3A4 inducer, as the effects of the inducer decline, the fentanyl plasma concentration will increase [see Clinical Pharmacology (12.3)], which could increase or prolong both the therapeutic effects and adverse reactions, and may cause serious respiratory depression. If concomitant use is necessary, consider increasing the fentanyl transdermal system dosage until stable drug effects are achieved. Monitor for signs of opioid withdrawal. If a CYP3A4 inducer is discontinued, consider fentanyl transdermal system dosage reduction and monitor for signs of respiratory depression. Due to additive pharmacologic effect, the concomitant use of benzodiazepines or other CNS depressants, including alcohol, can increase the risk of hypotension, respiratory depression, profound sedation, coma, and death. Reserve concomitant prescribing of these drugs for use in patients for whom alternative treatment options are inadequate. Limit dosages and durations to the minimum required. Follow patients closely for signs of respiratory depression and sedation [see Warnings and Precautions (5.7)]. Benzodiazepines and other sedatives/hypnotics, anxiolytics, tranquilizers, muscle relaxants, general anesthetics, antipsychotics, other opioids, alcohol. The concomitant use of opioids with other drugs that affect the serotonergic neurotransmitter system has resulted in serotonin syndrome [see Warnings and Precautions 5.10]. If concomitant use is warranted, carefully observe the patient, particularly during treatment initiation and dose adjustment. Discontinue fentanyl transdermal system if serotonin syndrome is suspected. Selective serotonin reuptake inhibitors (SSRIs), serotonin and norepinephrine reuptake inhibitors (SNRIs), tricyclic antidepressants (TCAs), triptans, 5-HT3 receptor antagonists, drugs that affect the serotonin neurotransmitter system (e.g., mirtazapine, trazodone, tramadol), monoamine oxidase (MAO) inhibitors (those intended to treat psychiatric disorders and also others, such as linezolid and intravenous methylene blue). MAOI interactions with opioids may manifest as serotonin syndrome [see Warnings and Precautions (5.10)] or opioid toxicity (e.g., respiratory depression, coma). The use of fentanyl transdermal system is not recommended for patients taking MAOIs or within 14 days of stopping such treatment. May reduce the analgesic effect of fentanyl transdermal system and/or precipitate withdrawal symptoms. Fentanyl transdermal system may enhance the neuromuscular blocking action of skeletal muscle relaxants and produce an increased degree of respiratory depression. Monitor patients for signs of respiratory depression that may be greater than otherwise expected and decrease the dosage of fentanyl transdermal system and/or the muscle relaxant as necessary. Monitor patients for signs of diminished diuresis and/or effects on blood pressure and increase the dosage of the diuretic as needed. Monitor patients for signs of urinary retention or reduced gastric motility when fentanyl transdermal system is used concomitantly with anticholinergic drugs. Prolonged use of opioid analgesics during pregnancy may cause neonatal opioid withdrawal syndrome [see Warnings and Precautions (5.4)]. Available data with fentanyl transdermal system in pregnant women are insufficient to inform a drug-associated risk for major birth defects and miscarriage. In animal reproduction studies, fentanyl administration to pregnant rats during organogenesis was embryocidal at doses within the range of the human recommended dosing. When administered during gestation through lactation fentanyl administration to pregnant rats resulted in reduced pup survival and developmental delays at doses within the range of the human recommended dosing. No evidence of malformations were noted in animal studies completed to date [see Data]. The estimated background risk of major birth defects and miscarriage for the indicated population is unknown. All pregnancies have a background risk of birth defect, loss, or other adverse outcomes. In the U.S. general population, the estimated background risk of major birth defects and miscarriage in clinically recognized pregnancies is 2 to 4% and 15 to 20%, respectively. Prolonged use of opioid analgesics during pregnancy for medical or nonmedical purposes can result in physical dependence in the neonate and neonatal opioid withdrawal syndrome shortly after birth. Neonatal opioid withdrawal syndrome presents as irritability, hyperactivity and abnormal sleep pattern, high pitched cry, tremor, vomiting, diarrhea, and failure to gain weight. The onset, duration, and severity of neonatal opioid withdrawal syndrome vary based on the specific opioid used, duration of use, timing and amount of last maternal use, and rate of elimination of the drug by the newborn. Observe newborns for symptoms of neonatal opioid withdrawal syndrome and manage accordingly [see Warnings and Precautions (5.4)]. Opioids cross the placenta and may produce respiratory depression and psycho-physiologic effects in neonates. An opioid antagonist, such as naloxone, must be available for reversal of opioid-induced respiratory depression in the neonate. Fentanyl transdermal system is not recommended for use in pregnant women during or immediately prior to labor, when use of shorter-acting analgesics or other analgesic techniques are more appropriate. Opioid analgesics, including fentanyl transdermal system, can prolong labor through actions that temporarily reduce the strength, duration, and frequency of uterine contractions. However, this effect is not consistent and may be offset by an increased rate of cervical dilatation, which tends to shorten labor. Monitor neonates exposed to opioid analgesics during labor for signs of excess sedation and respiratory depression. There are no adequate and well-controlled studies in pregnant women. Fentanyl transdermal system should be used during pregnancy only if the potential benefit justifies the potential risk to the fetus. Chronic maternal treatment with fentanyl during pregnancy has been associated with transient respiratory depression, behavioral changes, or seizures characteristic of neonatal abstinence syndrome in newborn infants. Symptoms of neonatal respiratory or neurological depression were no more frequent than expected in most studies of infants born to women treated acutely during labor with intravenous or epidural fentanyl. Transient neonatal muscular rigidity has been observed in infants whose mothers were treated with intravenous fentanyl. No evidence of malformations or adverse effects on the fetus was reported in a published study in which pregnant rats were administered fentanyl continuously via subcutaneously implanted osmotic minipumps at doses of 10, 100, or 500 mcg/kg/day starting 2 weeks prior to breeding and throughout pregnancy. The high dose was approximately 2 times the daily human dose administered by a 100 mcg/hr patch on a mg/m2 basis). In contrast, the intravenous administration of fentanyl (0, 0.01, or 0.03 mg/kg) to pregnant rats from Gestation Day 6 to 18 suggested evidence of embryo-toxicity and a slight increase in mean delivery time in the 0.03 mg/kg/day group (0.1 times the human dose administered by a 100 mcg/hr patch on a mg/m2 basis). There was no clear evidence of teratogenicity noted. Pregnant female New Zealand White rabbits were treated with fentanyl (0, 0.025, 0.1, 0.4 mg/kg) via intravenous infusion from day 6 to day 18 of pregnancy. Fentanyl produced a slight decrease in the body weight of the live fetuses at the high dose, which may be attributed to maternal toxicity. Under the conditions of the assay, there was no evidence for fentanyl induced adverse effects on embryo-fetal development at doses up to 0.4 mg/kg (approximately 3 times the daily human dose administered by a 100 mcg/hr patch on a mg/m2 basis). The potential effects of fentanyl on prenatal and postnatal development were examined in the rat model. Female Wistar rats were treated with 0, 0.025, 0.1, or 0.4 mg/kg/day fentanyl via intravenous infusion from day 6 of pregnancy through 3 weeks of lactation. Fentanyl treatment (0.4 mg/kg/day) significantly decreased body weight in male and female pups and also decreased survival in pups at day 4. Both the mid-dose and high-dose of fentanyl animals demonstrated alterations in some physical landmarks of development (delayed incisor eruption and eye opening) and transient behavioral development (decreased locomotor activity at day 28 which recovered by day 50). The mid-dose and the high-dose are 0.4 and 1.6 times the daily human dose administered by a 100 mcg/hr patch on a mg/m2 basis. Because of the potential for serious adverse reactions, including excess sedation and respiratory depression in a breastfed infant, advise patients that breastfeeding is not recommended during treatment with fentanyl transdermal system. Monitor infants exposed to fentanyl transdermal system through breast milk for excess sedation and respiratory depression. Withdrawal symptoms can occur in breastfed infants when maternal administration of an opioid analgesic is stopped, or when breast-feeding is stopped. Due to effects of androgen deficiency, chronic use of opioids may cause reduced fertility in females and males of reproductive potential. It is not known whether these effects on fertility are reversible [see Adverse Reactions (6.2) Clinical Pharmacology (12.2), Nonclinical Toxicology (13.1)]. The safety of fentanyl transdermal system was evaluated in three open-label trials in 289 pediatric patients with chronic pain, 2 years of age through 18 years of age. Starting doses of 25 mcg/hr and higher were used by 181 patients who had been on prior daily opioid doses of at least 45 mg/day of oral morphine or an equianalgesic dose of another opioid. Initiation of fentanyl transdermal system therapy in pediatric patients taking less than 60 mg/day of oral morphine or an equianalgesic dose of another opioid has not been evaluated in controlled clinical trials. The safety and effectiveness of fentanyl transdermal system in children under 2 years of age have not been established. To guard against excessive exposure to fentanyl transdermal system by young children, advise caregivers to strictly adhere to recommended fentanyl transdermal system application and disposal instructions [see Dosage and Administration (2.6), (2.7) and Warnings and Precautions (5.3)]. Clinical studies of fentanyl transdermal system did not include sufficient numbers of subjects aged 65 and over to determine whether they respond differently from younger subjects. Other reported clinical experience has not identified differences in responses between the elderly and younger patients. In general, use caution when selecting a dosage for an elderly patient, usually starting at the low end of the dosing range, reflecting the greater frequency of decreased hepatic, renal, or cardiac function, and of concomitant disease or other drug therapy. Data from intravenous studies with fentanyl suggest that the elderly patients may have reduced clearance and a prolonged half-life. Moreover, elderly patients may be more sensitive to the active substance than younger patients. A study conducted with the fentanyl transdermal system in elderly patients demonstrated that fentanyl pharmacokinetics did not differ significantly from young adult subjects, although peak serum concentrations tended to be lower and mean half-life values were prolonged to approximately 34 hours [see Clinical Pharmacology (12.3)]. Respiratory depression is the chief risk for elderly patients treated with opioids, and has occurred after large initial doses were administered to patients who were not opioid-tolerant or when opioids were co-administered with other agents that depress respiration. Titrate the dosage of fentanyl transdermal system slowly in geriatric patients and monitor closely for signs of central nervous system and respiratory depression [see Warnings and Precautions (5.9)]. Fentanyl is known to be substantially excreted by the kidney, and the risk of adverse reactions to this drug may be greater in patients with impaired renal function. Because elderly patients are more likely to have decreased renal function, care should be taken in dose selection, and it may be useful to monitor renal function. The effect of hepatic impairment on the pharmacokinetics of fentanyl transdermal system has not been fully evaluated. A clinical pharmacology study with fentanyl transdermal system in patients with cirrhosis has shown that systemic fentanyl exposure increased in these patients. Because there is in-vitro and in-vivo evidence of extensive hepatic contribution to the elimination of fentanyl transdermal system, hepatic impairment would be expected to have significant effects on the pharmacokinetics of fentanyl transdermal system. Avoid use of fentanyl transdermal system in patients with severe hepatic impairment [see Dosage and Administration (2.4), Warnings and Precautions (5.15) and Clinical Pharmacology (12.3)]. The effect of renal impairment on the pharmacokinetics of fentanyl transdermal system has not been fully evaluated. A clinical pharmacology study with intravenous fentanyl in patients undergoing kidney transplantation has shown that patients with high blood urea nitrogen level had low fentanyl clearance. Because there is in-vivo evidence of renal contribution to the elimination of fentanyl transdermal system, renal impairment would be expected to have significant effects on the pharmacokinetics of fentanyl transdermal system. Avoid the use of fentanyl transdermal system in patients with severe renal impairment [see Dosage and Administration (2.5), Warnings and Precautions (5.16) and Clinical Pharmacology (12.3)]. Fentanyl transdermal system contains fentanyl, a Schedule II controlled substance. Fentanyl transdermal system contains fentanyl, a substance with a high potential for abuse similar to other opioids including hydrocodone, hydromorphone, methadone, morphine, oxycodone, oxymorphone, and tapentadol. Fentanyl transdermal system can be abused and is subject to misuse, addiction, and criminal diversion [see Warnings and Precautions (5.1)]. The high drug content in long-acting formulations adds to the risk of adverse outcomes from abuse and misuse. All patients treated with opioids require careful monitoring for signs of abuse and addiction, because use of opioid analgesic products carries the risk of addiction even under appropriate medical use. Prescription drug abuse is the intentional non-therapeutic use of a prescription drug, even once, for its rewarding psychological or physiological effects. Drug addiction is a cluster of behavioral, cognitive, and physiological phenomena that develop after repeated substance use and includes: a strong desire to take the drug, difficulties in controlling its use, persisting in its use despite harmful consequences, a higher priority given to drug use than to other activities and obligations, increased tolerance, and sometimes physical withdrawal. â€œDrug seekingâ€ behavior is very common in persons with substance use disorders. Drug-seeking tactics include emergency calls or visits near the end of office hours, refusal to undergo appropriate examination, testing or referral, repeated â€œlossâ€ of prescriptions, tampering with prescriptions, and reluctance to provide prior medical records or contact information for other treating healthcare providers. â€œDoctor shoppingâ€ (visiting multiple prescribers to obtain additional prescriptions) is common among drug abusers and people suffering from untreated addiction. Preoccupation with achieving adequate pain relief can be appropriate behavior in a patient with poor pain control. Abuse and addiction are separate and distinct from physical dependence and tolerance. Healthcare providers should be aware that addiction may be accompanied by concurrent tolerance and symptoms of physical dependence in all addicts. In addition, abuse of opioids can occur in the absence of true addiction. Fentanyl transdermal system, like other opioids, can be diverted for non-medical use into illicit channels of distribution. Careful record-keeping of prescribing information, including quantity, frequency, and renewal requests, as required by state and federal law, is strongly advised. Proper assessment of the patient, proper prescribing practices, periodic reevaluation of therapy, and proper dispensing and storage are appropriate measures that help to limit abuse of opioid drugs. Fentanyl transdermal system is intended for transdermal use only. Abuse of fentanyl transdermal system poses a risk of overdose and death. This risk is increased with concurrent abuse of fentanyl transdermal system with alcohol and other central nervous system depressants [see Warnings and Precautions (5.7), and Drug Interactions (7)]. Intentional compromise of the transdermal delivery system may result in the uncontrolled delivery of fentanyl and pose a significant risk to the abuser that could result in overdose and death [see Warnings and Precautions (5.1)]. Abuse may occur by applying the transdermal system in the absence of legitimate purpose, or by swallowing, snorting or injecting fentanyl extracted from the transdermal system. Both tolerance and physical dependence can develop during chronic opioid therapy. Tolerance is the need for increasing doses of opioids to maintain a defined effect such as analgesia (in the absence of disease progression or other external factors). Tolerance may occur to both the desired and undesired effects of drugs, and may develop at different rates for different effects. Physical dependence results in withdrawal symptoms after abrupt discontinuation or a significant dosage reduction of a drug. Withdrawal also may be precipitated through the administration of drugs with opioid antagonist activity (e.g., naloxone, nalmefene), mixed agonist/antagonist analgesics (e.g., pentazocine, butorphanol, nalbuphine), or partial agonists (e.g., buprenorphine). Physical dependence may not occur to a clinically significant degree until after several days to weeks of continued opioid usage. Fentanyl transdermal system should not be abruptly discontinued [see Dosage and Administration (2.8)]. If fentanyl transdermal system is abruptly discontinued in a physically-dependent patient, a withdrawal syndrome may occur. Some or all of the following can characterize this syndrome: restlessness, lacrimation, rhinorrhea, yawning, perspiration, chills, myalgia, and mydriasis. Other signs and symptoms also may develop, including: irritability, anxiety, backache, joint pain, weakness, abdominal cramps, insomnia, nausea, anorexia, vomiting, diarrhea, or increased blood pressure, respiratory rate, or heart rate. Infants born to mothers physically dependent on opioids will also be physically dependent and may exhibit respiratory difficulties and withdrawal symptoms [see Use in Specific Populations (8.1)]. Acute overdose with fentanyl transdermal system can be manifested by respiratory depression, somnolence progressing to stupor or coma, skeletal muscle flaccidity, cold and clammy skin, constricted pupils, and, in some cases, pulmonary edema, bradycardia, hypotension, partial or complete airway obstruction, atypical snoring, and death. Marked mydriasis rather than miosis may be seen with hypoxia in overdose situations [see Clinical Pharmacology (12.2)]. Give primary attention to the reestablishment of a patent airway and institution of assisted or controlled ventilation, if needed. Employ other supportive measures (including oxygen and vasopressors) in the management of circulatory shock and pulmonary edema as indicated. Cardiac arrest or arrhythmias will require advanced life support techniques. Once stable, ensure examine the patient and ensure that all fentanyl transdermal systems have been removed. The opioid antagonists, such as naloxone or nalmefene, are specific antidotes to respiratory depression resulting from opioid overdose. For clinically significant respiratory or circulatory depression secondary to fentanyl overdose, administer an opioid antagonist. Opioid antagonists should not be administered in the absence of clinically significant respiratory or circulatory depression secondary to fentanyl overdose. Because the duration of opioid reversal is expected to be less than the duration of action of fentanyl in fentanyl transdermal systems, carefully monitor the patient until spontaneous respiration is reliably reestablished. After fentanyl transdermal system removal, serum fentanyl concentrations decline gradually, falling about 50% in approximately 20 to 27 hours. Therefore, management of an overdose must be monitored accordingly, at least 72 to 96 hours beyond the overdose. In an individual physically dependent on opioids, administration of the recommended usual dosage of the antagonist will precipitate an acute withdrawal syndrome. The severity of the withdrawal symptoms experienced will depend on the degree of physical dependence and the dose of the antagonist administered. If a decision is made to treat serious respiratory depression in the physically dependent patient, administration of the antagonist should be initiated with care and by titration with smaller than usual doses of the antagonist. Fentanyl transdermal system contains fentanyl, an opioid agonist, available as a patch for transdermal administration. The amount of fentanyl released from each system per hour is proportional to the surface area (25 mcg/hr per 7.8 cm2). The composition per unit area of all system sizes is identical. The nâ€‘octanol: water partition coefficient is 860:1. The pKa is 8.4. 4) a silicone adhesive. Before use, a protective liner covering the adhesive layer is removed and discarded. Fentanyl is an opioid agonist. Fentanyl interacts predominately with the opioid mu-receptor. These mu-binding sites are distributed in the human brain, spinal cord, and other tissues. Fentanyl produces respiratory depression by direct action on brain stem respiratory centers. The respiratory depression involves a reduction in the responsiveness of the brain stem respiratory centers to both increases in carbon dioxide tension and electrical stimulation. Fentanyl causes miosis, even in total darkness. Pinpoint pupils are a sign of opioid overdose but are not pathognomonic (e.g., pontine lesions of hemorrhagic or ischemic origins may produce similar findings). Marked mydriasis rather than miosis may be seen due to hypoxia in overdose situations. In clinical trials of 357 non-opioid tolerant subjects treated with fentanyl transdermal system, 13 subjects experienced hypoventilation. Hypoventilation was manifested by respiratory rates of less than 8 breaths/minute or a pCO2 greater than 55 mm Hg. In these studies, the incidence of hypoventilation was higher in nontolerant women (10) than in men (3) and in subjects weighing less than 63 kg (9 of 13). Although subjects with prior impaired respiration were not common in the trials, they had higher rates of hypoventilation. In addition, postmarketing reports have been received that describe opioid-naive post-operative patients who have experienced clinically significant hypoventilation and death with fentanyl transdermal system. Hypoventilation can occur throughout the therapeutic range of fentanyl serum concentrations, especially for patients who have an underlying pulmonary condition or who receive concomitant opioids or other CNS drugs associated with hypoventilation. The use of fentanyl transdermal system is contraindicated in patients who are not tolerant to opioid therapy. Fentanyl causes a reduction in motility associated with an increase in smooth muscle tone in the antrum of the stomach and duodenum. Digestion of food in the small intestine is delayed and propulsive contractions are decreased. Propulsive peristaltic waves in the colon are decreased, while tone is increased to the point of spasm, resulting in constipation. Other opioid-induced effects may include a reduction in biliary and pancreatic secretions, spasm of sphincter of Oddi, and transient elevations in serum amylase. Fentanyl produces peripheral vasodilation, which may result in orthostatic hypotension or syncope. Manifestations of histamine release and/or peripheral vasodilation may include pruritus, flushing, red eyes, sweating, and/or orthostatic hypotension. Histamine assays and skin wheal testing in clinical studies indicate that clinically significant histamine release rarely occurs with fentanyl administration. Clinical assays show no clinically significant histamine release in dosages up to 50 mcg/kg. Opioids inhibit the secretion of adrenocorticotropic hormone (ACTH), cortisol, and luteinizing hormone (LH) in humans [see Adverse Reactions (6.2)]. They also stimulate prolactin, growth hormone (GH) secretion, and pancreatic secretion of insulin and glucagon. Chronic use of opioids may influence the hypothalamic-pituitary-gonadal axis, leading to androgen deficiency that may manifest as low libido, impotence, erectile dysfunction, amenorrhea, or infertility. The causal role of opioids in the clinical syndrome of hypogonadism is unknown because the various medical, physical, lifestyle, and psychological stressors that may influence gonadal hormone levels have not been adequately controlled for in studies conducted to date [see Adverse Reactions (6.2)]. Opioids have been shown to have a variety of effects on components of the immune system in in vitro and animal models. The clinical significance of these findings is unknown. Overall, the effects of opioids appear to be modestly immunosuppressive. The minimum effective analgesic concentration will vary widely among patients, especially among patients who have been previously treated with potent agonist opioids. The minimum effective analgesic concentration of fentanyl for any individual patient may increase over time due to an increase in pain, the development of a new pain syndrome, and/or the development of analgesic tolerance [see Dosage and Administration (2.1, 2.3)]. There is a relationship between increasing fentanyl plasma concentration and increasing frequency of dose-related opioid adverse reactions such as nausea, vomiting, CNS effects, and respiratory depression. In opioid-tolerant patients, the situation may be altered by the development of tolerance to opioid-related adverse reactions [see Dosage and Administration (2.1, 2.2, 2.3)]. Fentanyl transdermal system is a drug-in-adhesive matrix designed formulation. Fentanyl is released from the matrix at a nearly constant amount per unit time. The concentration gradient existing between the matrix and the lower concentration in the skin drives drug release. Fentanyl moves in the direction of the lower concentration at a rate determined by the matrix and the diffusion of fentanyl through the skin layers. While the actual rate of fentanyl delivery to the skin varies over the 72-hour application period, each system is labeled with a nominal flux which represents the average amount of drug delivered to the systemic circulation per hour across average skin. While there is variation in dose delivered among patients, the nominal flux of the systems (12.5, 25, 50, 75, and 100 mcg of fentanyl per hour) is sufficiently accurate as to allow individual titration of dosage for a given patient. Following fentanyl transdermal system application, the skin under the system absorbs fentanyl, and a depot of fentanyl concentrates in the upper skin layers. Fentanyl then becomes available to the systemic circulation. Serum fentanyl concentrations increase gradually following initial fentanyl transdermal system application, generally leveling off between 12 and 24 hours and remaining relatively constant, with some fluctuation, for the remainder of the 72-hour application period. Peak serum concentrations of fentanyl generally occurred between 20 and 72 hours after initial application (see Table 7). 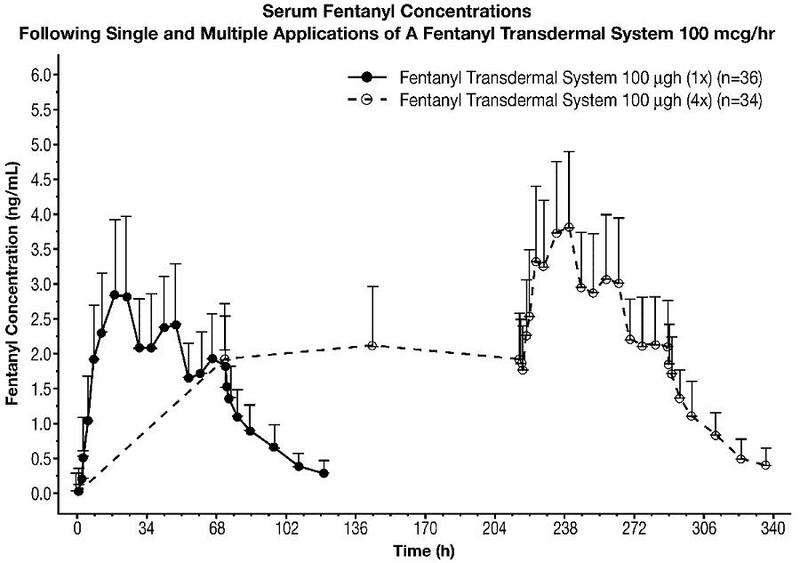 Serum fentanyl concentrations achieved are proportional to the fentanyl transdermal system delivery rate. With continuous use, serum fentanyl concentrations continue to rise for the first two system applications. By the end of the second 72-hour application, a steady-state serum concentration is reached and is maintained during subsequent applications of a patch of the same size (see Figure 1). Patients reach and maintain a steady-state serum concentration that is determined by individual variation in skin permeability and body clearance of fentanyl. After system removal, serum fentanyl concentrations decline gradually, falling about 50% in approximately 20 to 27 hours. Continued absorption of fentanyl from the skin accounts for a slower disappearance of the drug from the serum than is seen after an IV infusion, where the apparent half-life is approximately 7 (range 3 to 12) hours. A clinical pharmacology study conducted in healthy adult subjects has shown that the application of heat over the fentanyl transdermal system increased mean overall fentanyl exposure by 120% and average maximum fentanyl level by 61%. NOTE: After system removal there is continued systemic absorption from residual fentanyl in the skin so that serum concentrations fall 50%, on average, in approximately 20 to 27 hours. NOTE: Information on volume of distribution and half-life not available for renally impaired patients. Fentanyl plasma protein binding capacity decreases with increasing ionization of the drug. Alterations in pH may affect its distribution between plasma and the central nervous system. Fentanyl accumulates in the skeletal muscle and fat and is released slowly into the blood. The average volume of distribution for fentanyl is 6 L/kg (range 3 to 8; N=8). Fentanyl is metabolized primarily via human cytochrome P450 3A4 isoenzyme system. In humans, the drug appears to be metabolized primarily by oxidative N-dealkylation to norfentanyl and other inactive metabolites that do not contribute materially to the observed activity of the drug. Skin does not appear to metabolize fentanyl delivered transdermally. This was determined in a human keratinocyte cell assay and in clinical studies in which 92% of the dose delivered from the system was accounted for as unchanged fentanyl that appeared in the systemic circulation. Within 72 hours of IV fentanyl administration, approximately 75% of the dose is excreted in urine, mostly as metabolites with less than 10% representing unchanged drug. Approximately 9% of the dose is recovered in the feces, primarily as metabolites. Mean values for unbound fractions of fentanyl in plasma are estimated to be between 13 and 21%. Data from intravenous studies with fentanyl suggest that the elderly patients may have reduced clearance and a prolonged half-life. Moreover elderly patients may be more sensitive to the active substance than younger patients. A study conducted with the fentanyl transdermal system in elderly patients demonstrated that fentanyl pharmacokinetics did not differ significantly from young adult subjects, although peak serum concentrations tended to be lower and mean half-life values were prolonged to approximately 34 hours. In this study, a single fentanyl transdermal system 100 mcg/hour patch was applied to a skin site on the upper outer arm in a group of healthy elderly Caucasians â‰¥65 years old (n=21, mean age 71 years) and worn for 72 hours. The mean Cmax and AUCâˆž values were approximately 8% lower and 7% higher, respectively, in the elderly subjects as compared with subjects 18 to 45 years old. Inter-subject variability in AUCâˆž was higher in elderly subjects than in healthy adult subjects 18 to 45 years (58% and 37%, respectively). The mean half-life value was longer in subjects â‰¥65 years old than in subjects 18 to 45 years old (34.4 hours versus 23.5 hours) [see Warnings and Precautions (5.9) and Use in Specific Populations (8.5)]. In 1.5 to 5 year old, non-opioid-tolerant pediatric patients, the fentanyl plasma concentrations were approximately twice as high as that of adult patients. In older pediatric patients, the pharmacokinetic parameters were similar to that of adults. However, these findings have been taken into consideration in determining the dosing recommendations for opioid-tolerant pediatric patients (2 years of age and older). For pediatric dosing information, refer to [see Dosage and Administration (2.2)]. Information on the effect of hepatic impairment on the pharmacokinetics of fentanyl transdermal system is limited. The pharmacokinetics of fentanyl transdermal system delivering 50 mcg/hour of fentanyl for 72 hours was evaluated in patients hospitalized for surgery. Compared to the controlled patients (n=8), Cmax and AUC in the patients with cirrhosis (n=9) increased 35% and 73%, respectively. Because there is in-vitro and in-vivo evidence of extensive hepatic contribution to the elimination of fentanyl transdermal system, hepatic impairment would be expected to have significant effects on the pharmacokinetics of fentanyl transdermal system. Avoid use of fentanyl transdermal system in patients with severe hepatic impairment [see Dosage and Administration (2.4), Warnings and Precautions (5.15), and Use in Specific Populations (8.6)]. Information on the effect of renal impairment on the pharmacokinetics of fentanyl transdermal system is limited. The pharmacokinetics of intravenous injection of 25 mcg/kg fentanyl was evaluated in patients (n=8) undergoing kidney transplantation. An inverse relationship between blood urea nitrogen level and fentanyl clearance was found. Because there is in-vivo evidence of renal contribution to the elimination of fentanyl transdermal system, renal impairment would be expected to have significant effects on the pharmacokinetics of fentanyl transdermal system. Avoid the use of fentanyl transdermal system in patients with severe renal impairment [see Dosage and Administration (2.5), Warnings and Precautions (5.16) and Use in Specific Populations (8.7)]. Fentanyl is metabolized mainly via the human cytochrome P450 3A4 isoenzyme system (CYP3A4). The interaction between ritonavir, a CYP3A4 inhibitor, and fentanyl was investigated in eleven healthy volunteers in a randomized crossover study. Subjects received oral ritonavir or placebo for 3 days. The ritonavir dose was 200 mg three times a day on Day 1 and 300 mg three times a day on Day 2 followed by one morning dose of 300 mg on Day 3. On Day 2, fentanyl was given as a single IV dose at 5 mcg/kg two hours after the afternoon dose of oral ritonavir or placebo. Naloxone was administered to counteract the side effects of fentanyl. The results suggested that ritonavir might decrease the clearance of fentanyl by 67%, resulting in a 174% (range 52% to 420%) increase in fentanyl AUC0-âˆž. The concomitant use of transdermal fentanyl with all CYP3A4 inhibitors (such as ritonavir, ketoconazole, itraconazole, troleandomycin, clarithromycin, nelfinavir, nefazadone, amiodarone, amprenavir, aprepitant, diltiazem, erythromycin, fluconazole, fosamprenavir, verapamil, or grapefruit juice) may result in an increase in fentanyl plasma concentrations, which could increase or prolong adverse drug effects and may cause potentially fatal respiratory depression. Carefully monitor patients receiving fentanyl transdermal system and any CYP3A4 inhibitor for signs of respiratory depression for an extended period of time and adjust the dosage if warranted [see Boxed Warning and Warnings and Precautions (5.5), and Drug Interactions (7)]. Co-administration with agents that induce CYP3A4 activity may reduce the efficacy of fentanyl transdermal system. 100 mcg/kg/day in females (0.16 and 0.39 times the human daily exposure obtained via the 100 mcg/hr patch based on AUC0-24h comparison). There was no evidence of mutagenicity in the Ames Salmonella mutagenicity assay, the primary rat hepatocyte unscheduled DNA synthesis assay, the BALB/c 3T3 transformation test, and the human lymphocyte and CHO chromosomal aberration in-vitro assays. 28 days prior to mating; female rats were not treated. In the female fertility study, female rats were treated with fentanyl (0, 0.025, 0.1 or 0.4 mg/kg/day) via continuous intravenous infusion for 14 days prior to mating until day 16 of pregnancy; male rats were not treated. Analysis of fertility parameters in both studies indicated that an intravenous dose of fentanyl up to 0.4 mg/kg/day to either the male or the female alone produced no effects on fertility (this dose is approximately 1.6 times the daily human dose administered by a 100 mcg/hr patch on a mg/m2 basis). In a separate study, a single daily bolus dose of fentanyl was shown to impair fertility in rats when given in intravenous doses of 0.3 times the human dose for a period of 12 days. Fentanyl transdermal system as therapy for pain due to cancer has been studied in 153 patients. In this patient population, fentanyl transdermal system has been administered in doses of 25 mcg/hr to 600 mcg/hr. Individual patients have used fentanyl transdermal system continuously for up to 866 days. At one month after initiation of fentanyl transdermal system therapy, patients generally reported lower pain intensity scores as compared to a pre-study analgesic regimen of oral morphine. The duration of fentanyl transdermal system use varied in cancer patients; 56% of patients used fentanyl transdermal system for over 30 days, 28% continued treatment for more than 4 months, and 10% used fentanyl transdermal system for more than 1 year. In the pediatric population, the safety of fentanyl transdermal system has been evaluated in 289 patients with chronic pain 2 to 18 years of age. The duration of fentanyl transdermal system use varied; 20% of pediatric patients were treated for â‰¤ 15 days; 46% for 16 to 30 days; 16% for 31 to 60 days; and 17% for at least 61 days. Twenty-five patients were treated with fentanyl transdermal system for at least 4 months and 9 patients for more than 9 months. Fentanyl transdermal system is supplied in cartons containing 5 individual child-resistant packaged systems. See chart for information regarding individual systems. • This lowest strength is designated as 12 mcg/hr (however, the actual strength is 12.5 mcg/hr) to distinguish it from a 125 mcg/hr strength that could be prescribed by using multiple patches. Store in original unopened pouch. Store up to 25°C (77°F); excursions permitted to 15 to 30°C (59 to 86°F) [see USP Controlled Room Temperature]. Inform patients that the use of fentanyl transdermal system, even when taken as recommended, can result in addiction, abuse, and misuse, which can lead to overdose and death [see Warnings and Precautions (5.1)]. Instruct patients not to share fentanyl transdermal system with others and to take steps to protect fentanyl transdermal system from theft or misuse. Inform patients of the risk of life-threatening respiratory depression, including information that the risk is greatest when starting fentanyl transdermal system or when the dosage is increased, and that it can occur even at recommended dosages [see Warnings and Precautions (5.2)]. Advise patients how to recognize respiratory depression and to seek medical attention if breathing difficulties develop. Inform patients that accidental exposure, especially in children, may result in respiratory depression or death [see Warnings and Precautions (5.3)]. Instruct patients to take steps store fentanyl transdermal system securely and to dispose of unused fentanyl transdermal system by flushing down the toilet [see Dosage and Administration (2.7)]. Fentanyl transdermal system can be accidentally transferred to children. Instruct patients to take special precautions to avoid accidental contact when holding or caring for children. Instruct patients that, if the patch dislodges and accidentally sticks to the skin of another person, to immediately take the patch off, wash the exposed area with water and seek medical attention for the accidentally exposed individual as accidental exposure may lead to death or other serious medical problems. Instruct patients to refer to the Instructions for Use for proper disposal of fentanyl transdermal system. To properly dispose of a used patch, instruct patients to remove it, fold so that the adhesive side of the patch adheres to itself, and immediately flush down the toilet. Unused patches should be removed from their pouches, the protective liners removed, the patches folded so that the adhesive side of the patch adheres to itself, and immediately flushed down the toilet. Inform patients that deaths have occurred from accidental exposure to fentanyl transdermal systems discarded in the trash. Inform patients and caregivers that potentially fatal additive effects may occur if fentanyl transdermal system is used with benzodiazepines or other CNS depressants, including alcohol, and not to use these concomitantly unless supervised by a healthcare provider [see Warnings and Precautions (5.7), Drug Interactions (7)]. Inform patients that opioids could cause a rare but potentially life-threatening condition resulting from concomitant administration of serotonergic drugs. Warn patients of the symptoms and signs of serotonin syndrome, and to seek medical attention right away if symptoms develop. Instruct patients to inform their healthcare providers if they are taking, or plan to take serotonergic medications [see Warnings and Precautions (5.10) and Drug Interactions (7)]. Inform patients to avoid taking fentanyl transdermal system while using any drugs that inhibit monoamine oxidase. Patients should not start MAOIs while taking fentanyl transdermal system [see Drug Interactions (7)]. Inform patients that opioids could cause adrenal insufficiency, a potentially life-threatening condition. Adrenal insufficiency may present with non-specific symptoms and signs such as nausea, vomiting, anorexia, fatigue, weakness, dizziness, and low blood pressure. Advise patients to seek medical attention if they experience a constellation of these symptoms [see Warnings and Precautions (5.11)]. Advise patients never to change the dose of fentanyl transdermal system or the number of patches applied to the skin unless instructed to do so by the prescribing healthcare professional. When no longer needed, advise patients how to safely taper fentanyl transdermal system and not to stop it abruptly to avoid the risk of precipitating withdrawal symptoms. avoid exposing the fentanyl transdermal system application site and surrounding area to direct external heat sources including heating pads, electric blankets, sunbathing, heat or tanning lamps, saunas, hot tubs or hot baths, and heated waterbeds. Inform patients that fentanyl transdermal system may cause orthostatic hypotension and syncope. Instruct patients how to recognize symptoms of low blood pressure and how to reduce the risk of serious consequences should hypotension occur (e.g., sit or lie down, carefully rise from a sitting or lying position) [see Warnings and Precautions (5.12)]. Inform patients that anaphylaxis, including anaphylactic shock, has been reported with ingredients contained in fentanyl transdermal system. Advise patients how to recognize such a reaction and when to seek medical attention [see Contraindications (4), Adverse Reactions (6)]. Inform female patients of reproductive potential that prolonged use of fentanyl transdermal system during pregnancy can result in neonatal opioid withdrawal syndrome, which may be life-threatening if not recognized and treated [see Warnings and Precautions (5.4), Use in Specific Populations (8.1)]. Inform female patients of reproductive potential that fentanyl transdermal system can cause fetal harm and to inform their healthcare provider of known or suspected pregnancy [see Use in Specific Populations (8.1)]. Advise patients that breastfeeding is not recommended during treatment with fentanyl transdermal system [see Use in Specific Populations (8.2)]. Inform patients that chronic use of opioids may cause reduced fertility. It is not known whether these effects on fertility are reversible [see Use in Specific Populations (8.3)]. Inform patients that fentanyl transdermal system may impair the ability to perform potentially hazardous activities such as driving a car or operating heavy machinery. Advise patients not to perform such tasks until they know how they will react to the medication [see Warnings and Precautions (5.20)]. Advise patients of the potential for severe constipation, including management instructions and when to seek medical attention [see Adverse Reactions (6), Clinical Pharmacology (12.2)]. An electronic copy of this medication guide can be obtained from www.mallinckrodt.com/Medguide/X30000067.pdf or by calling 1-800-778-7898 for alternate delivery options. A strong prescription pain medicine that contains an opioid (narcotic) that is used to manage pain severe enough to require daily around-the-clock, long-term treatment with an opioid, in people who are already regularly using opioid pain medicine, when other pain treatments such as non-opioid pain medicines or immediate-release opioid medicines do not treat your pain well enough or you cannot tolerate them. A long-acting (extended-release) opioid pain medicine that can put you at risk for overdose and death. Even if you take your dose correctly as prescribed you are at risk for opioid addiction, abuse, and misuse that can lead to death. Get emergency help right away if you use too much fentanyl transdermal system (overdose). When you first start taking fentanyl transdermal system, when your dose is changed, or if you take too much (overdose), serious or life-threatening breathing problems that can lead to death may occur. Taking fentanyl transdermal system with other opioid medicines, benzodiazepines, alcohol, or other central nervous system depressants (including street drugs) may cause severe drowsiness, decreased awareness, breathing difficulties, with slow or shallow breathing, coma, and death. Never give anyone else your fentanyl transdermal system. They could die from using it. Store fentanyl transdermal system away from children and in a safe place to prevent stealing or abuse. Selling or giving away fentanyl transdermal system is against the law. If the patch accidentally sticks to a family member while in close contact, take the patch off, wash the area with water, and get emergency help right away because an accidental exposure to fentanyl transdermal system can lead to death or other serious medical problems. Proper disposal of fentanyl transdermal system after use and for unused patches when no longer needed: Fold the sticky sides of the patch together and flush down the toilet. Do not put patches in a trash can. are pregnant or planning to become pregnant. Prolonged use of fentanyl transdermal system during pregnancy can cause withdrawal symptoms in your newborn baby that could be life-threatening if not recognized and treated. are breastfeeding. Not recommended during treatment with fentanyl transdermal system. It may harm your baby. are taking prescription or over-the-counter medicines, vitamins, or herbal supplements. Taking fentanyl transdermal system with certain other medicines can cause serious side effects that could lead to death. Do not change your dose. Apply fentanyl transdermal system exactly as prescribed by your healthcare provider. Use the lowest dose possible for the shortest time needed. See the detailed Instructions for Use for information about how to apply and dispose of the fentanyl transdermal system. Do not apply more than 1 patch at the same time unless your healthcare provider tells you to. You should wear the fentanyl transdermal system continuously for 3 days, unless advised otherwise by your healthcare provider. Do not cut, break, chew, crush, dissolve, snort, or inject fentanyl transdermal system because this may cause you to overdose and die. Call your healthcare provider if the dose you are using does not control your pain. Do not stop using fentanyl transdermal system without talking to your healthcare provider. Take hot baths or sunbathe, use hot tubs, saunas, heating pads, electric blankets, heated waterbeds, or tanning lamps, or engage in exercise that increases your body temperature. These can cause an overdose that can lead to death. Drive or operate heavy machinery, until you know how fentanyl transdermal system affects you. Fentanyl transdermal system can make you sleepy, dizzy, or lightheaded. Drink alcohol or use prescription or over-the-counter medicines that contain alcohol. Using products containing alcohol during treatment with fentanyl transdermal system may cause you to overdose and die. Be sure that you read, understand, and follow these Instructions for Use before you apply fentanyl transdermal system. Talk to your healthcare provider or pharmacist if you have any questions. Fentanyl transdermal systems are a rectangular, opaque patch with rounded corners. Each fentanyl transdermal system is sealed in its own protective pouch. Do not remove a fentanyl transdermal system from the pouch until you are ready to use it. Do not use a fentanyl transdermal system if the pouch seal is broken or the patch is cut, damaged or changed in any way. Fentanyl transdermal systems are available in 5 different dosage strengths and patch sizes. Make sure you have the right dose patch or patches that have been prescribed for you. Put the patch on the chest, back, flank (sides of the waist), or upper arm in a place where there is no hair (see Figures 1-4). Put the patch on the upper back (see Figure 2). This will lower the chances that the child will remove the patch and put it in their mouth. Do not put a fentanyl transdermal system on skin that is very oily, burned, broken out, cut, irritated, or damaged in any way. Avoid sensitive areas or those that move around a lot. If there is hair, do not shave (shaving irritates the skin). Instead, clip hair as close to the skin as possible (see Figure 5). Talk to your healthcare provider if you have questions about skin application sites. Choose the time of day that is best for you to apply fentanyl transdermal system. Change it at about the same time of day (3 days or 72 hours after you apply the patch) or as directed by your healthcare provider. Do not wear more than one fentanyl transdermal system at a time unless your healthcare provider tells you to do so. Before applying a new fentanyl transdermal system, remove the patch you have been wearing. Clean the skin area with clear water only. Pat skin completely dry. Do not use anything on the skin such as soaps, lotions, oils, or alcohol before the patch is applied. 3. Open the pouch: Fold and tear at slit, or cut at line taking care not to cut the patch. Remove the fentanyl transdermal system. Each fentanyl transdermal system is sealed in its own protective pouch. Do not remove the fentanyl transdermal system from the pouch until you are ready to use it (see Figure 6). 4. Peel: Peel off both parts of the protective liner from the patch. Each fentanyl transdermal system has a clear plastic backing that can be peeled off in two pieces. This covers the sticky side of the patch. Carefully peel this backing off. Throw the clear plastic backing away. Touch the sticky side of the fentanyl transdermal system as little as possible (see Figure 7). 5. Press: Press the patch onto the chosen skin site with the palm of your hand and hold there for at least 30 seconds (see Figure 8). Make sure it sticks well, especially at the edges. Fentanyl transdermal system may not stick to all people. You need to check the patch often to make sure that it is sticking well to the skin. If the patch falls off right away after applying, throw it away and put a new one on at a different skin site. See the section below called "Disposing of a fentanyl transdermal system". Apply first aid tape only to the edges of the patch. If you continue to have problems with the patch not sticking, you may cover the patch with a transparent adhesive film dressing such as Bioclusiveâ„¢ or Tegadermâ„¢. These are special see-through adhesive dressings. Never cover a fentanyl transdermal system with any other bandage or tape. Remove the backing from the Bioclusiveâ„¢ or Tegadermâ„¢ dressing and place it carefully over the fentanyl transdermal system, smoothing it over the patch and your skin. If your patch falls off before 3 days (72 hours) of use, dispose of (throw away) properly. See the section below "Disposing of a fentanyl transdermal system". Apply a new fentanyl transdermal system on at a different skin site. Be sure to let your healthcare provider know that this has happened, and do not replace the new patch until 3 days (72 hours) after you put it on (or as directed by your healthcare provider). 6. Wash your hands when you have finished applying a fentanyl transdermal system. 7. Remove a fentanyl transdermal system after wearing it for 3 days (72 hours). Dispose of the used patch right away. See the section below "Disposing of a fentanyl transdermal system". Choose a different skin site to apply a new fentanyl transdermal system. Repeat Steps 2 through 6 above when applying a new fentanyl transdermal system. Do not apply the new patch to the same place as the last one. You can bathe, swim or shower while you are wearing a fentanyl transdermal system. If the patch falls off before 3 days (72 hours) after application, dispose of properly. See the section below â€œDisposing of a fentanyl transdermal systemâ€. Apply a new fentanyl transdermal system on at a different skin site. Be sure to let your healthcare provider know that this has happened, and do not replace the new patch until 3 days (72 hours) after you put it on (or as directed by your healthcare provider). Fold the used fentanyl transdermal system in half so that the sticky side sticks to itself (see Figure 9). Flush the used fentanyl transdermal system down the toilet right away (see Figure 10). A used fentanyl transdermal system can be very dangerous for or lead to death in babies, children, pets, and adults who have not been prescribed fentanyl transdermal system. Throw away any fentanyl transdermal systems that are left over from your prescription as soon as they are no longer needed. Remove the leftover patches from their protective pouch and remove the protective liner. Fold the patches in half with the sticky sides together, and flush the patches down the toilet. Do not flush the pouch or the protective liner down the toilet. These items can be thrown away in a trash can. Mallinckrodt, the â€œMâ€ brand mark and the Mallinckrodt Pharmaceuticals logo are trademarks of a Mallinckrodt company. Bioclusiveâ„¢ and Tegadermâ„¢ are trademarks of their respective owners. LTS Lohmann Therapy Systems, Corp.
Read enclosed fentanyl transdermal system Medication Guide for important safety information. PHARMACIST: Dispense the Medication Guide provided separately to each patient.